"We would highly recommend the CLP 320 to anyone who wants a superb and beautiful digital piano for the home!" MSRP: Check with an authorized Yamaha piano dealer. None. Being the entry-level model in the line up, the CLP 320 far exceeded our expectations! UPDATE (10/29/08): Clavinova CLP 300 series is now available in U.S. markets. Can a Clavinova be even better than it already is? Yes, much better. In July 2008, Yamaha introduced the brand new CLP 300 series to the European, Asian, Canadian, Brazilian, and Oceania markets. This article is the first of a series of four which will review these amazing CLP 300 series digital pianos. 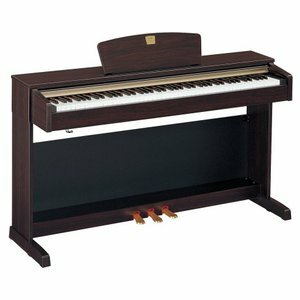 The Clavinova CLP 320 is a great improvement over the CLP 220. With 128 notes of polyphony, 3-level AWM dynamic stereo sampling, and damper with half pedal effect, we were quite impressed with this instrument also considering that the CLP 320 is the entry-level model in its class. One of the most dramatic new features of the CLP 320 is its increase of polyphony—to 128 notes of polyphony (CLP 220 has 64 notes of polyphony). Putting some perspective on this number, the flagship CLP 380 also has 128 notes of polyphony! Now that's really impressive! Another great new feature is the 3-level AWM dynamic stereo sampling feature to the CLP 320. This was a feature that was only available to higher end CLP 200 series instruments. From the clips we've heard, this piano sounds absolutely fantastic! And finally, the damper with half pedal effect was again another feature that was found only in higher end CLPs—now available to the CLP 320. (For those who aren't familiar with the half pedal effect, on a real piano the damper pedal controls the amount of sustain in your sound and is varied by how much you press down on the pedal. The half pedal effect mimics this feature.) Again, this is another plus for Yamaha! The CLP 320 comes with 10 different voices ranging from pianos and organs to harpsichords, and strings. The only new voice we found on the CLP 320 was the new 3-level dynamic piano samples, which, if that was the only voice we ever played again would still make us very happy! The CLP 320 allows you to record your own compositions and performances. When you're ready to record, simply press the REC button to start recording then when you're finished recording press the REC button to end the recording. To play back the recorded song just press the PLAY button and to stop playback press PLAY again. Now that's simple and straight forward. You can save just one song on the CLP 320 with a maximum performance length of about 11,000 notes; however, you can use its onboard MIDI interface to transmit sequences to a computer for saving and editing. Just like the Clavinova CLP 220 the CLP 320 also comes with an effects processor that adds realism to your playing. There's a choice of 4 different reverbs—a room, 2 halls, and a stage and you can very the amount of depth (wet/dry mix) too. So, for example, once you record your performance, you realize that the song sounds better with the stage reverb set to a depth of 11. Just dial in your effect settings and press PLAY to hear your recorded song play back with the new settings! You can make these changes at anytime! Lastly, the CLP 320 allows the user to play in dual mode; that is you can choose any two voices and blend them together to create more texture. It also comes with two 20W amps and two 12 cm X 6 cm oval speakers built into the cabinet, two headphone jacks (useful while two people are playing together), MIDI IN/OUT ports, and comes finished from the factory in rosewood, mahogany, or cherry. The one thing that really impressed us was all the features (128 notes of polyphony, 3-level AWM dynamic stereo sampling, and damper with half pedal effect) made available to the entry-level Clavinova CLP 300 series model. These are features that we have seen in higher end Clavinova CLP models, so, seeing all these great features makes us very excited to what's to come with the other CLP 300 models. We would highly recommend the CLP 320 to anyone who wants a superb and beautiful digital piano for the home!